The softer than anticipated economic news of recent weeks aligned with economic weakness emanating from European and Asian markets to drive investment capital into U.S. Treasurys and other safety vehicles. Recent volatility in the equity markets had already placed investors on edge, and the slight downturn in retail sales together with a decline in a major manufacturing index sent a shock through the stock markets. However, other economic indicators such as employment growth and consumer confidence have demonstrated some durability, offering healthy, if not spectacular, growth outlooks. Furthermore, Treasury rates, now flirting with 2.0 percent, will extend support for the housing market as the Fed potentially hesitates in lifting the Federal Funds rate. Overall, the national economy remains on a growth trajectory despite recent volatility in the equity markets. Retail sales declined 0.3 percent in September as a pullback in store receipts was broad based and impacted nearly every segment of the industry. Although automobile sales declined, per-unit prices inched higher, mitigating the impact of fewer shoppers on car lots. Gasoline prices have retreated 13 percent since the end of June, which generated fewer trips to retailers that sell gas. Core retail sales, which excludes autos and gasoline, dipped 0.1 percent last month. Softness in the housing market dragged down sales 1.1 percent at building materials stores and 0.8 percent at furniture and home furnishing establishments. It should be noted, however, that on an annual basis, retail sales are still up 4.3 percent from last year — on track with the long-term average growth rate. While the monthly retail sales release was weaker than anticipated, some positive signs emerged. Store receipts at electronics and appliance retailers soared 3.4 percent behind the release of the iPhone 6. Nonstore/Internet retailers, which record finalized sales upon delivery rather than the initial transaction, will also likely recoup their 1.1 percent decline posted in September as their iPhone sales predominantly post in October. Restaurants also demonstrated positive momentum, posting 0.6 percent growth and reiterating that discretionary spending remains on track. Although nonstore/Internet retail sales have significantly increased their share of total retail receipts since the recession, bricks-and-mortar retail continues to trend toward pre-recession performance levels. Vacancy will approach the previous low of 6.3 percent by year end, while space demand will finish 2014 at 5.7 percent above the level at the onset of the downturn. 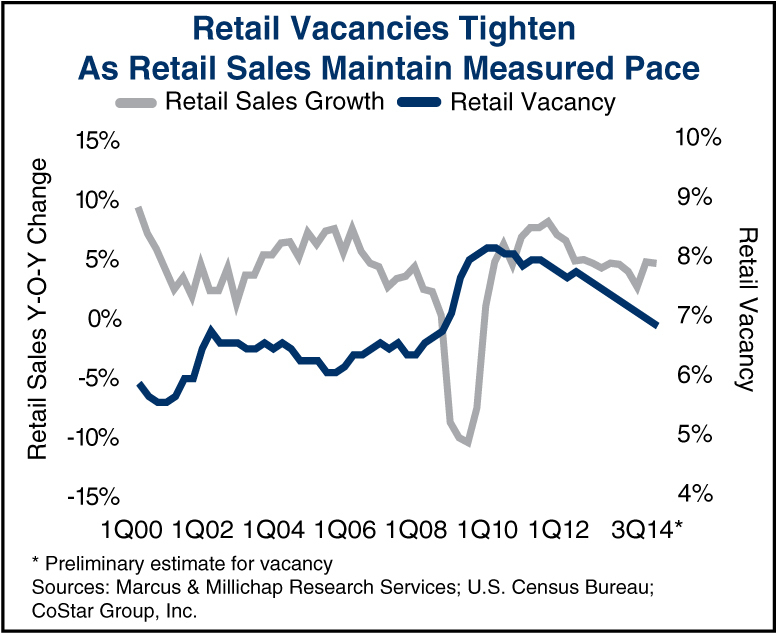 Nonstore/Internet retail sales have soared by 60 percent since the recession as buyer behavior has shifted. Most retailers anticipate this trend to be permanent, which is the driving force behind omni-channel retailing. This blend of showroom and stockroom space targets this new shopping experience, and it will lift industrial demand by 2.1 percent this year and help tighten vacancy to nearly 7 percent. This entry was written by marcusmillichap, posted on October 15, 2014 at 10:00 pm, filed under Research and tagged Commercial Real Estate, Commercial Real Estate Research, Hiring, Retail Sales. Bookmark the permalink. Follow any comments here with the RSS feed for this post. Post a comment or leave a trackback: Trackback URL.